1) New collaborations and old - Guitarist Greg Tackett joins me on the road, while reuniting in the studio with friends Terry Luan and Aaron Kraft. 2) Performances - With our first gig under our belts, Greg and I look forward to performing regularly at venues across Taipei. 3) Videos - A couple of highlights from the "pilot" performance with Greg Tackett. 4) Photos - We were very lucky to have professional photographer, Zenith Lin, in our audience at last month's show and he was kind of enough to share them with us. 5) ... and more new music coming soon! In the meantime, there is new material in the works with friends and collaborators, Aaron Kraft and Terry Luan. (Not to mention, Mia and Erykah Wu.) Though the miles and busy schedules keep things moving slowly, we surely hope to bring you some new material in the near future. Here's a refresher on some of the music we've done to date: "Resurrection", "Check My Smile", "City Hunter", and "Discover Taiwan (探索台灣)". Last December 14th saw my triumphant, if low key (Ha! 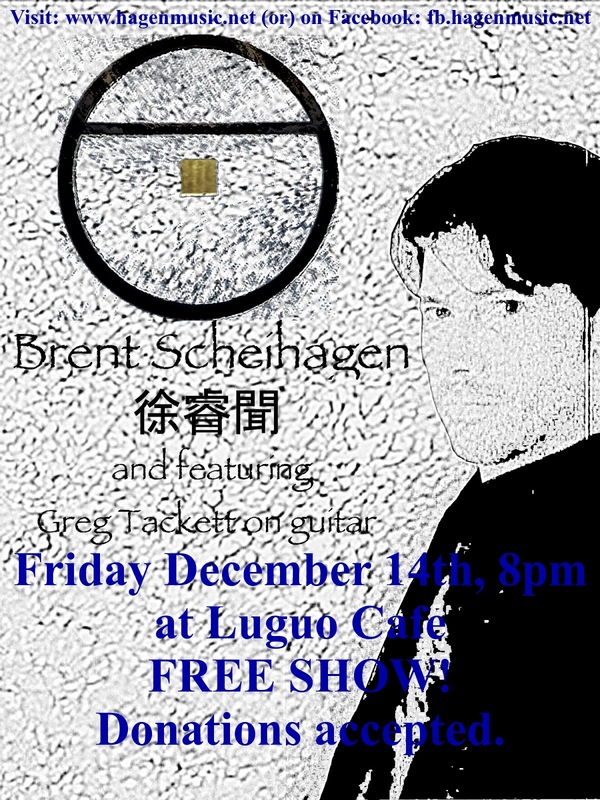 ), return to the stage at Luguo Cafe in New Taipei City. After performing a set on my own comprised mostly of my own material, I was joined by Mr. Tackett for a set dominated by covers of some our favorite songs. It was a great night and I was so happy to be performing again as I've really missed it. Thankfully, Greg and I already have plans for another show next month in Taipei at the Taipei Arts Village. With luck, we'll be able to get a show in at least once a month (not easy, as we're both working full-time!) and have a few guests sit in with us now and again. As you can see, Greg and I are both huge Beatles, U2 and Radiohead fans, so don't be surprised to see more covers from bands like these in the future. (Our next show will feature an even greater variety of material.) Apart from the covers, all other songs were written by myself with the exceptions of "Everywhere (My Love)" (music by Chris Rogers, lyrics by BDS) and "Truth Comes" (written by Kyle Scheihagen). As we go, Greg and I intend to do more and more original material; however, we expect to be playing a fair number of covers for some time, because A) original material takes a little longer to perfect and B) we love playing our favorite songs and paying homage to our favorite artists. I plan to share a couple more videos from the show in the near future, including one with an English to Chinese translation of the lyrics, so look forward to that. A special thank you to Lee Hongui and Jessie Lin for recording the show and sharing their videos with us! Many thanks to Luguo, Zenith Lin and everyone who came out to support us! As always, there's lots of music in various stages of completion. I'm not sure what exactly I'll be trying to finish up next, but you can be sure that there's still more to come. If any of it gives any one of you some measure of joy, peace, satisfaction, reason for contemplation or whatever, then I suppose it's worth it. Another person who knows Greg and is trying to get in touch with him. If possible can you have him contact Steve Hanlon at rshanlon at Gmail. It's regarding a song we wrote together 7 years ago. Tks!